Difficulty Notes: A very remote peak, the main difficulty will be having enough energy to complete it! Our route on Marmota Peak and exit back to the Waterfowl Lakes parking lot. The plan worked remarkably well. After a quick breakfast we were on our way in the dark. Steven led masterfully around the first part of the traverse until finally the day slowly dawned and we could navigate without head lamps. Of course the side-hilling was starting to wear a little (!!) 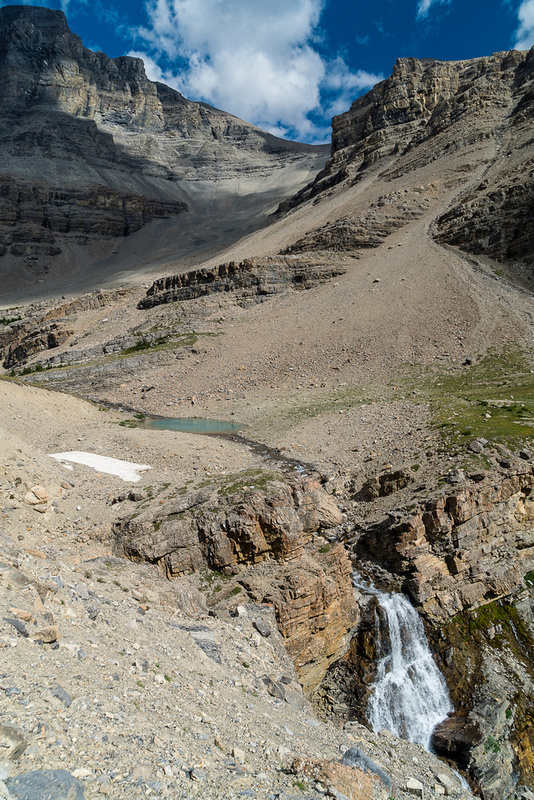 thin by this time, but we slowly made our way past lovely hidden tarns and up more cascading streams until we were finally on the approach to our key access gully. A gorgeous sunrise along Spreading Creek and Corona Ridge (L). A hidden tarn provides fresh water and some great views to distract us from the painful side-hilling. This tarn is essential to the route as it provides access to the back bowl and scree gully via the stream / gully at the far end. Annoying moraines blocked easy access and once again we were plodding up and down them before passing one last tarn and starting the loose ascent of the gully. 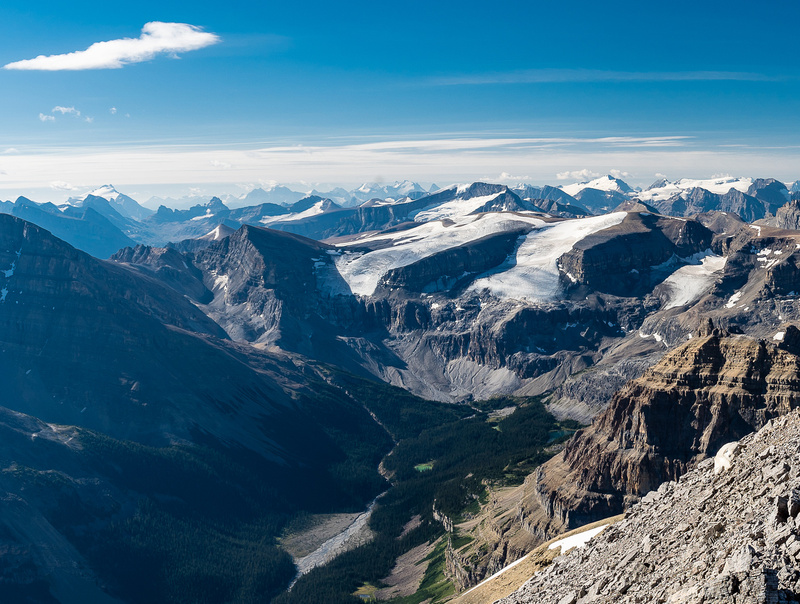 Where the gully steepened, we cut climber’s left to gain the summit of the sw-ne ridge to Marmota’s west face. 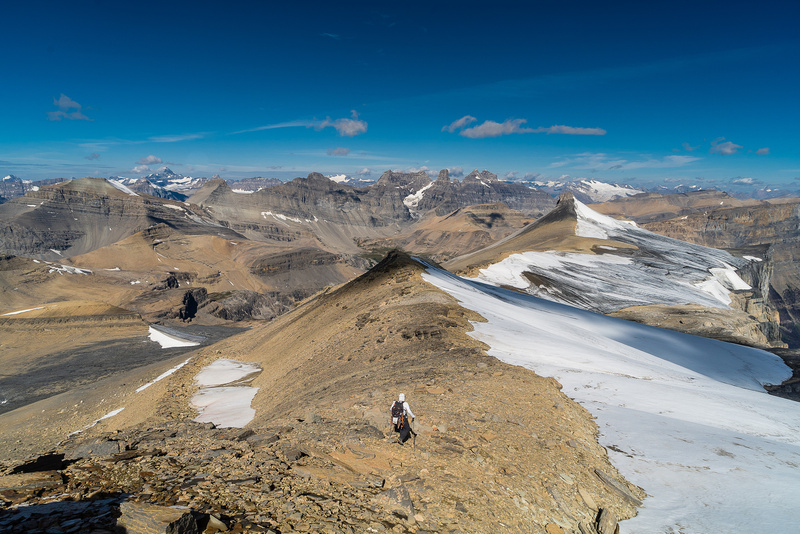 Even this ridge had some height gain / loss but the views were absolutely gorgeous on this clear, cool summer morning so we weren’t complaining. 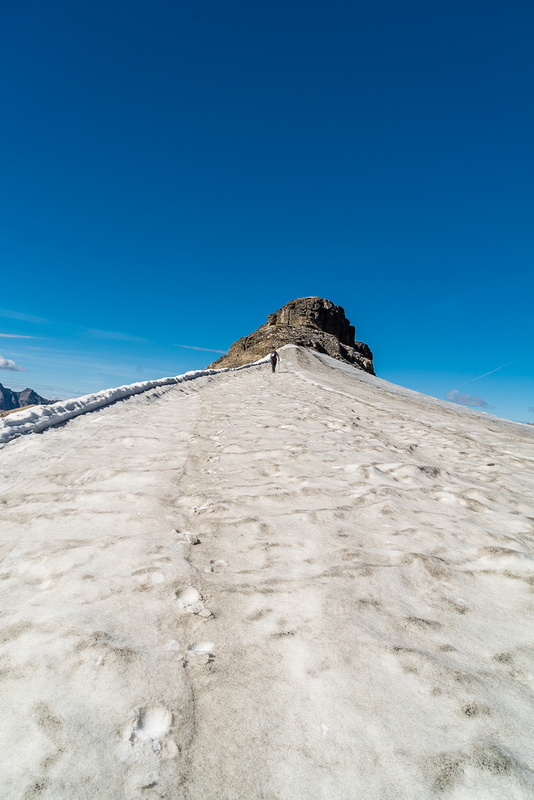 We even walked briefly on a remnant glacier before finally looking up at the 400 remaining vertical meters to the summit of Marmota, gained via black limestone steps with verglass and steep scree slopes. It took us almost 4 hours to this point, so a 5 hour ascent from the bivy was looking possible. Interesting landscapes as we approach the west face of Marmota. The lower summit that we didn’t climb in the distance here. Our summit out of sight to the right. 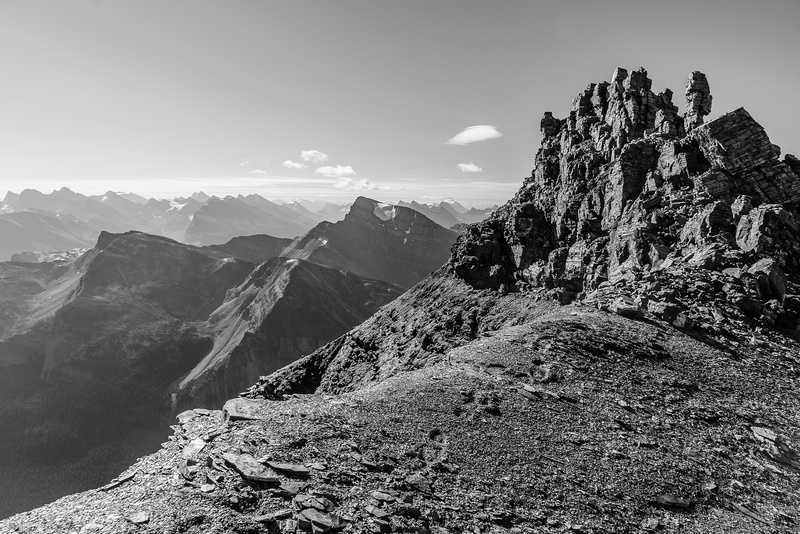 After ascending the slick, frozen dinner plate scree of Marmota’s west face we found ourselves with a heckuva view on the upper ridge of the mountain. A small glacier on the east side provided great views as we continued climbing straight up the ridge. We finally reached the summit around 5 hours after leaving our bivy and this was at a pretty fast pace. The views were absolutely mind blowing in the great morning light. No haze, no smoke and no obstructions. The summit measured at 3120m on both our barometric GPS units – well above Corona Ridge. 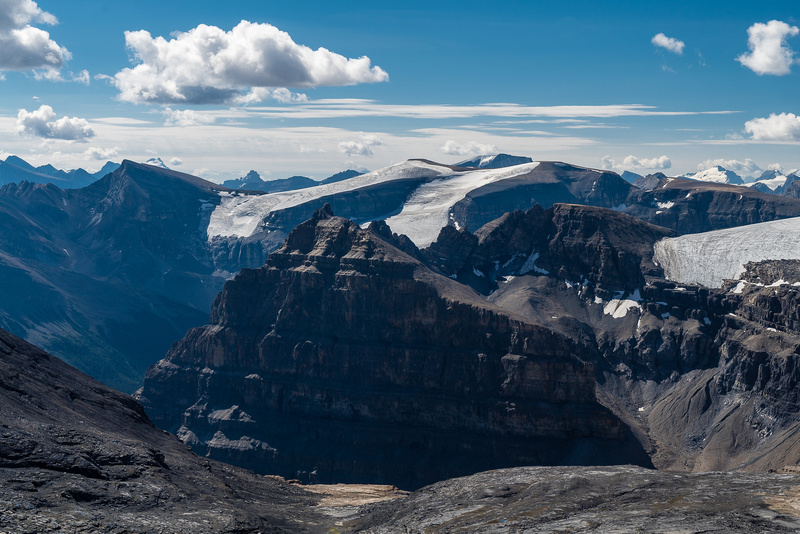 Looking south and west, back along the ridge that granted us access to the west face of Marmota. 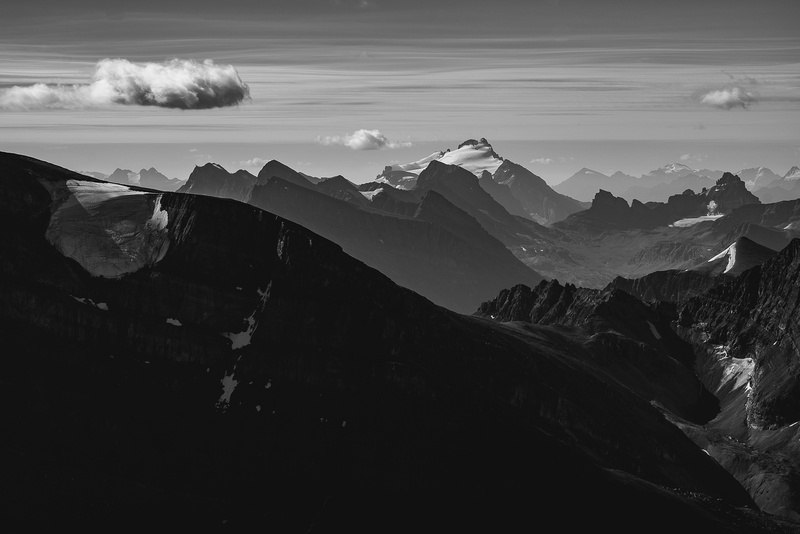 Peaks include Weed, Noyes, Howse and Chephren. A steep scree slope leads down from the access ridge to the remnant glacier which granted us access to Marmota’s west face. It was again, surprising how many remnant glaciers exist in this area. A few hundred years ago this must have been quite the icefield. I was determined to find an original ascent register, since we were sure that we were only the 2nd or 3rd ascent of this peak – it is way in the middle of nowhere. 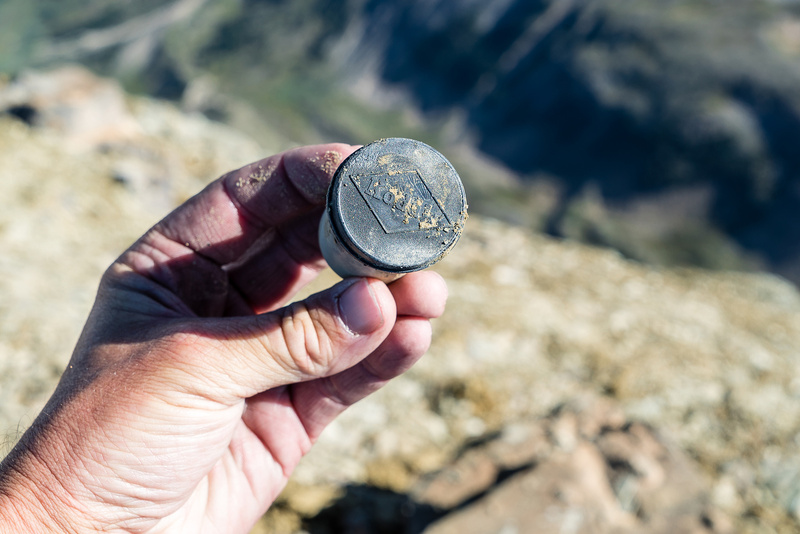 I almost gave up but persevered and I finally spotted a small film canister buried in the collapsed summit cairn! Yes – this is always very exciting. 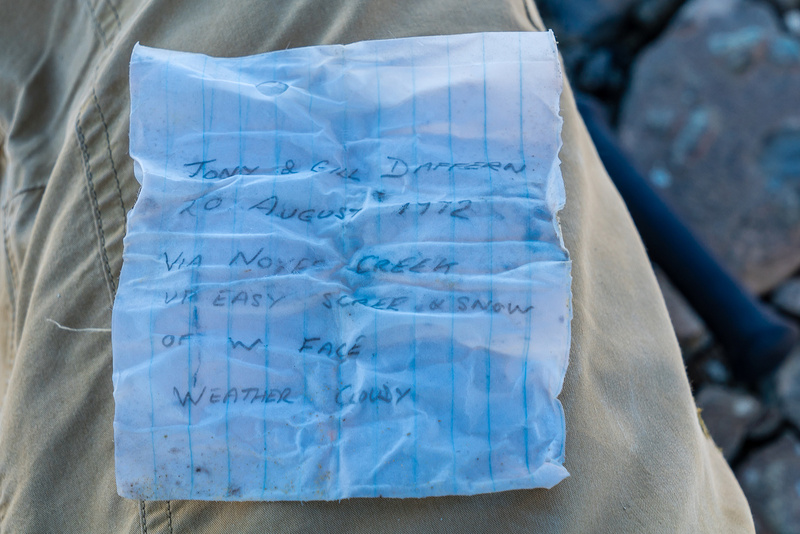 The last time I found an original summit register was on Hooge Peak and it was from 1946! This one was also soaking wet but as I delicately unfolded the sheet of paper I could read it. It was 43 years old and from the guidebook husband/wife team of Tony and Gillian Daffern! Very cool. They climbed from Noyes Creek in 1972 – three years before I was even born! I replaced their record with a dry sheet of paper and added our names. A possible 2nd ascent but I can’t know that for sure. I do know that not many folks have stood on the summit of Marmota Peak. Looking south we wondered if the crumbly summit there was any higher. 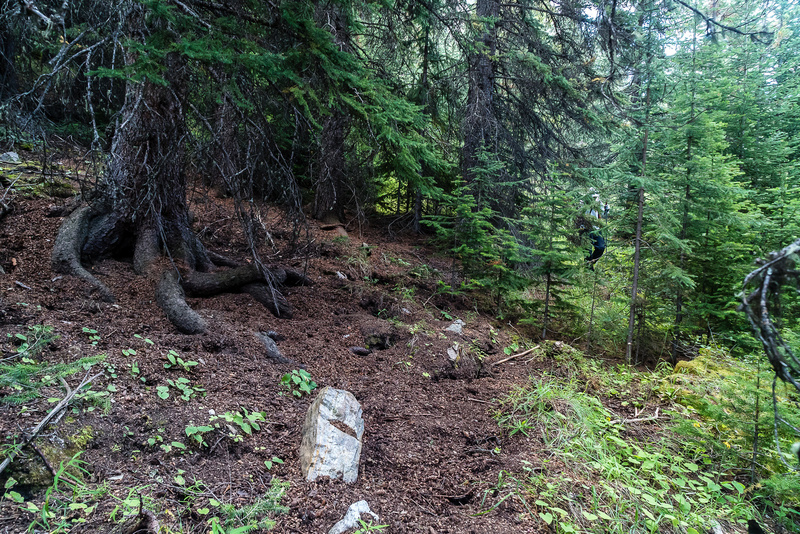 Only one way to find out – we made our way over and up the loose pile of rocks. Nope. It is also 3120m and only because of the rickety cairn on it. After a ton of summit photos we prepared for the long descent. 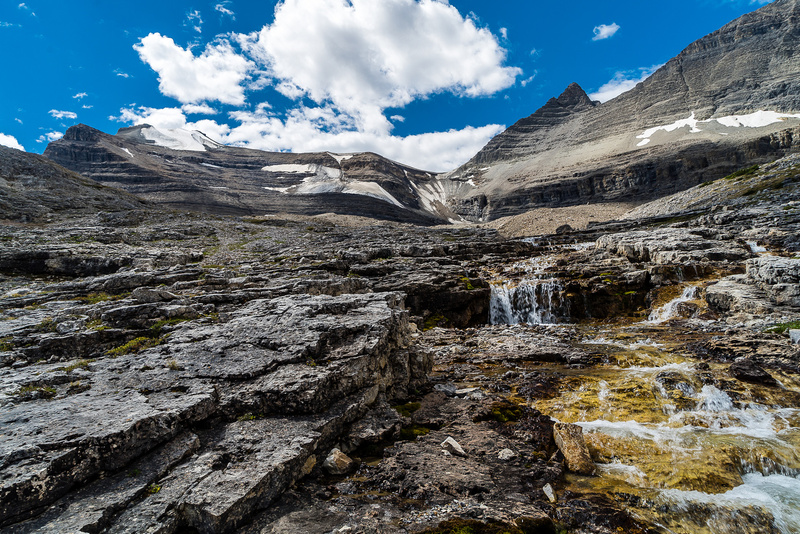 Looking up the headwaters of Porcupine Creek at the backside (east) of Observation Peak. 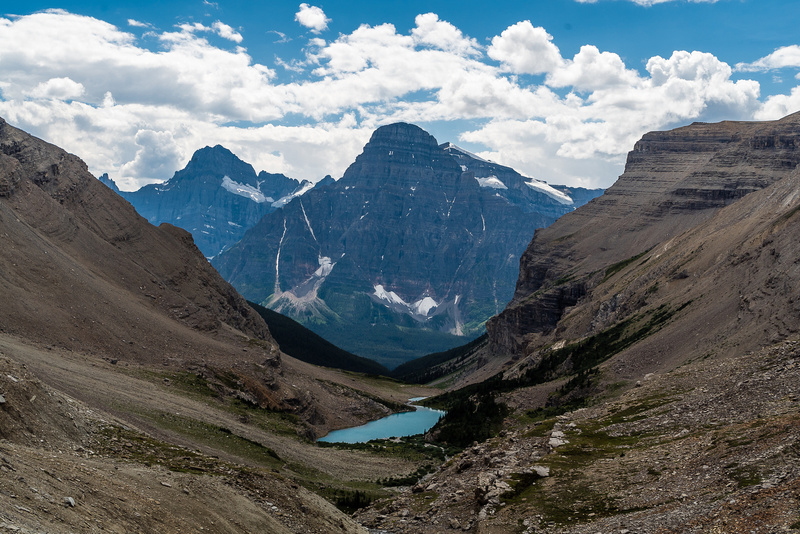 Gorgeous views into Porcupine Creek and its lakes / tarns with Louden (L) and Quill (R) peaks. Our descent was fairly easy – simply retracing our ascent route. There were lots of ups and downs, of course, and tons of side-hilling again. Thankfully there was a nice cool breeze the entire time, making the summer heat bearable. We arrived at our bivy pretty stiff and sore already from the previous 24 hours of exercise, but our trip time of 9 hours was excellent so we took half an hour to relax at camp before packing up and heading back up to the Totem Col with heavier packs. Steven heads down with Noyes rising at left. Back near our bivy looking up to the lower summit of Marmota at distant center-right. River Beauties and the upper Totem Lake. The gorgeous environs of Lower Totem Lake with towers of Murchison in the background. The day was quite warm as we worked our way back down Totem Creek to highway 93 but there were no difficulties other than the pain of even more side-hilling! When we got to the highway we found ourselves plodding along the black top with a line up of cars waiting for construction! Our parking plan worked perfectly as it was just ahead of the line up. The construction workers I chatted with along the highway were quite surprised when I told them where we’d been. I heard them exclaiming as I walked away that they couldn’t imagine just “bushwhacking into the middle of nowhere” like we just did. 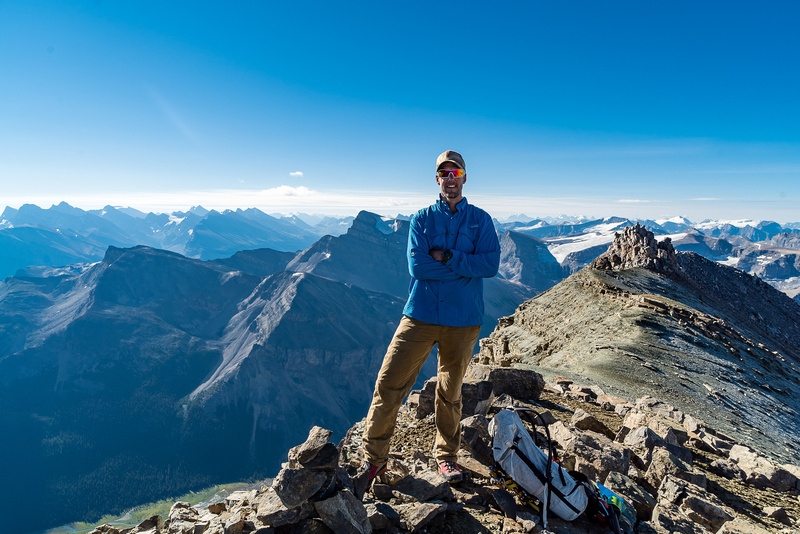 It felt really good to get a couple of lesser known summits that are actually very lofty and very scenic. I’ll be back up Totem Creek one day to tag some more peaks back in the Spreading Creek Valley, but I’ll have to let my mind forget the nasty side-hilling first. the sun is just starting to think about getting up and we're already around the corner of our traverse. Marmota at upper left. A gorgeous sunrise with Spreading Creek and Corona Ridge. A hidden tarn provides fresh water and some great views to distract us from the painful side-hilling. Steep scree up to the abutment ridge. A tarn along the way. Steven on the sw-ne ridge with Marmota's west face far in the distance still. The very impressive towers of Englehard, Cromwell and Hall with Murchison at right. Our col from Totem Creek is the tiny patch of green at lower center. A unique view of Mount Noyes (L). A steep scree slope leads down from the access ridge to the remnant glacier which granted us access to Marmota's west face. On the frozen scree of Marmota's west face. Thankfully this dried off in the sun so we didn't slip around on descent. 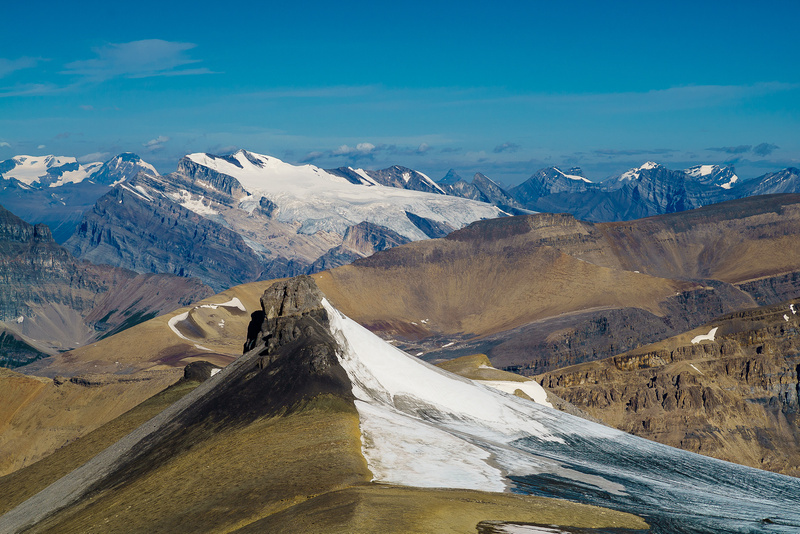 On the summit rige with stunning views to the south / west including a surprising number of small glaciers. Scrambling along the summit ridge. Vern on the summit of Marmota Peak. Very cool! 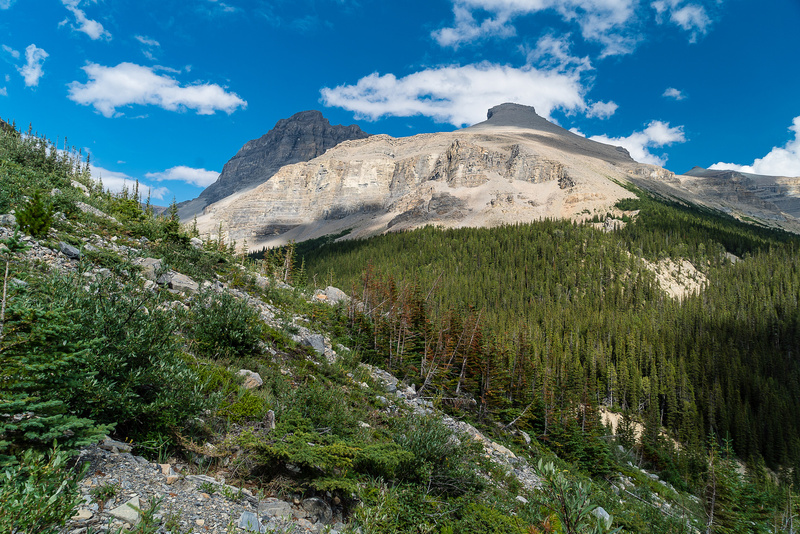 Rockies legends Tony and Gill Daffern ascended this peak in 1972, 43 years ago. 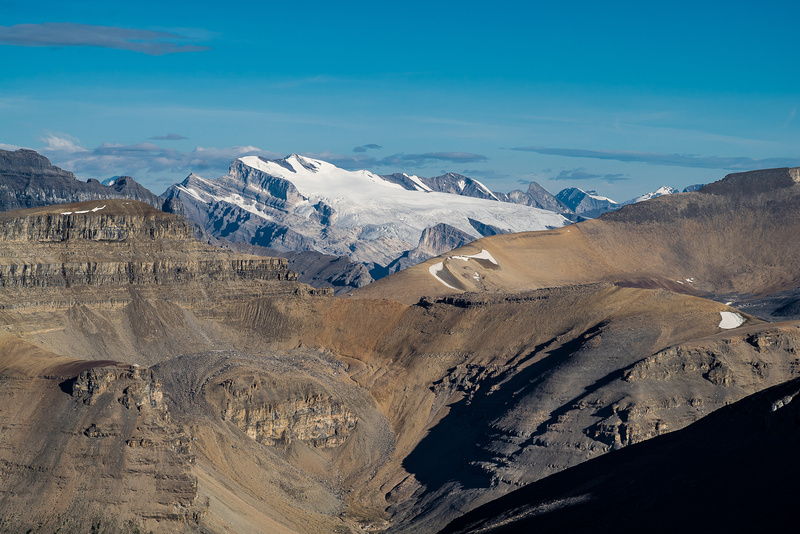 Looking towards Mounts Weed and Noyes with the Mummery Icefield in the distance. 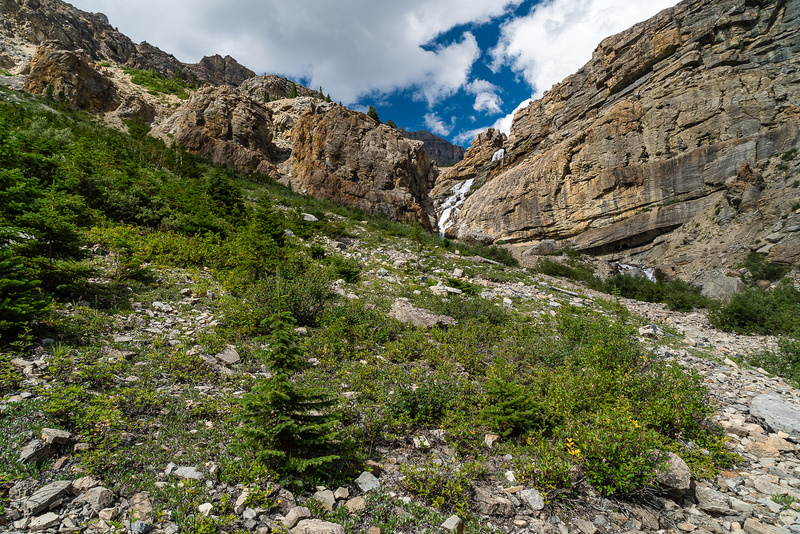 Looking up the headwaters of Porcupine Creek at the backside (east) of Observation Peak. The mountain in the foreground left is Quill Peak. 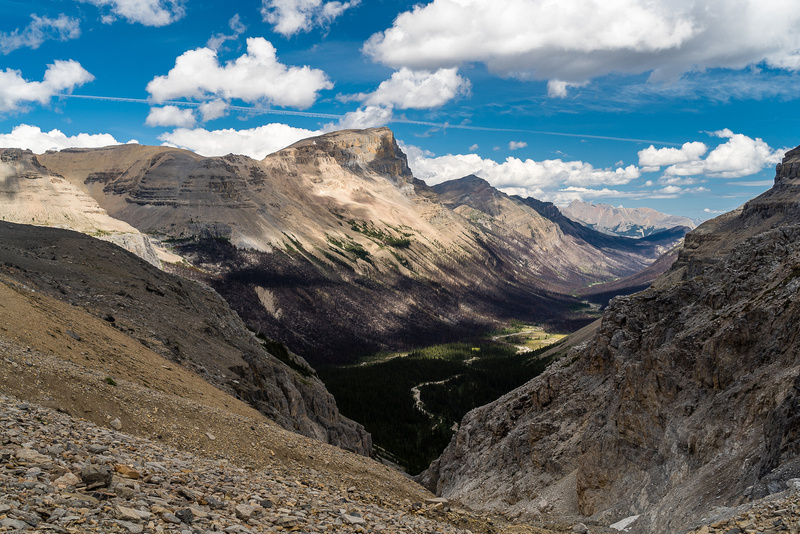 Looking up the valley we used to access Recondite Peak - now that's a long way in the middle of bloody nowhere! 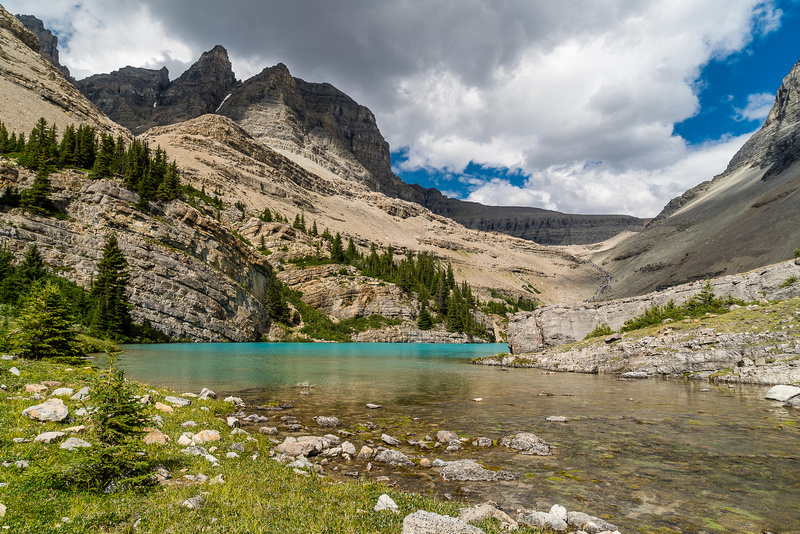 Beautiful lakes along Porcupine Creek on the east side of Marmota Peak. Mount Balfour shows up over Observation Peak with Olive and Gordon to the right. The distinctive summit of Mount Hector. Recondite, Harris, Crown and Willingdon. 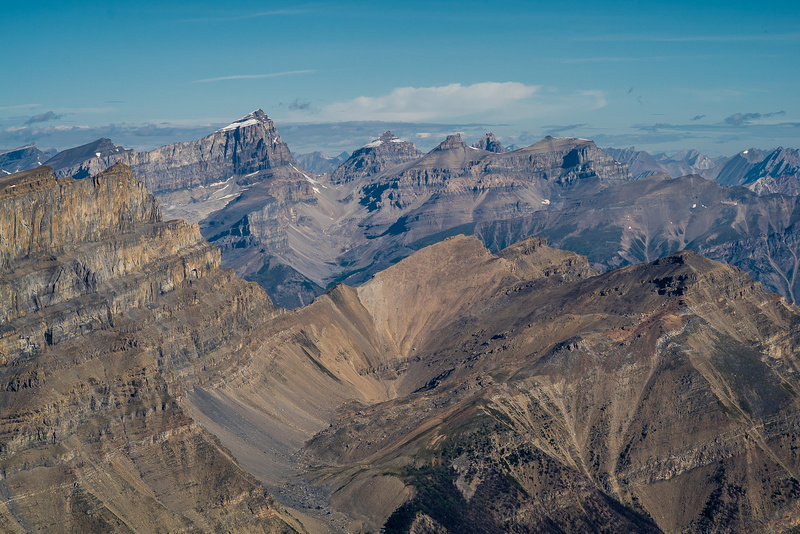 Mount Forbes - highest peak in Banff National Park. Bison in the foreground right. Mount Wilson is another big peak in the area. 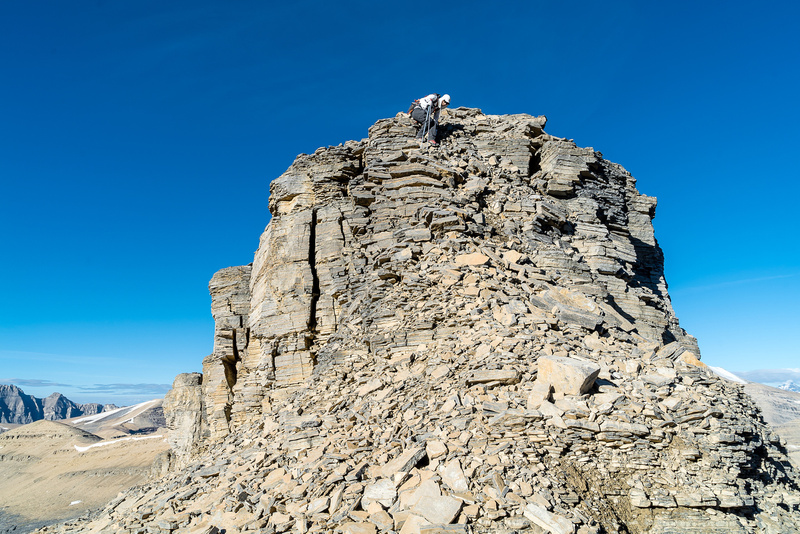 The southernmost summit of Marmota is a loose pile of rock! It's the same height as the nearby rounded summit. 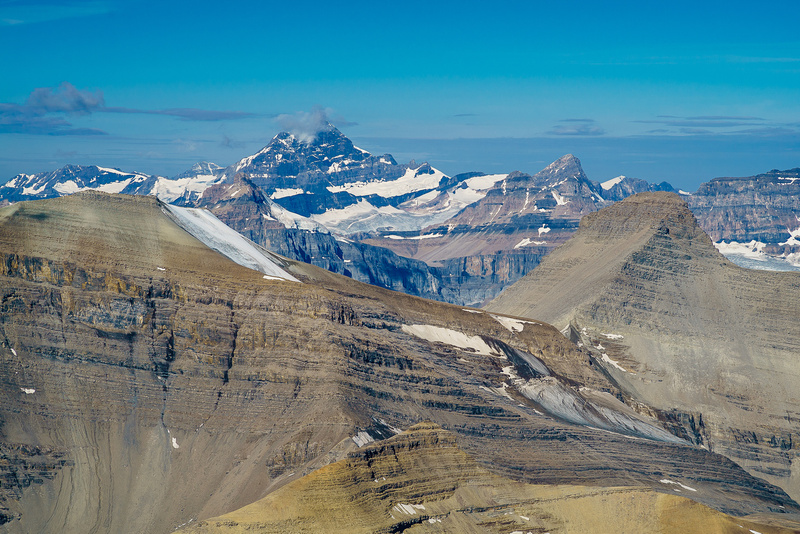 Two large peaks to the east are Peskett (L) and Louden (R) and are 3124m and 3221m respectively. Amazing view of Corona Ridge (L) with Cline, Troll, Lion, Dasent and Lioness peaks beyond. 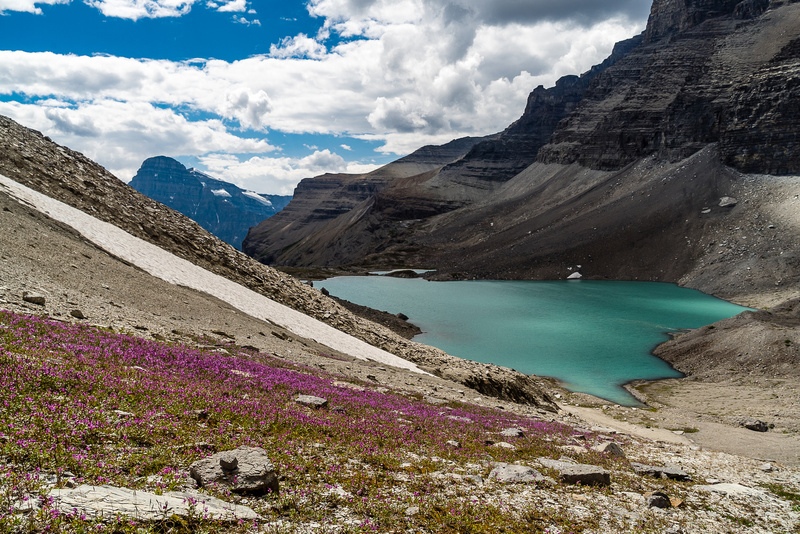 Gorgeous views into Porcupine Creek and its lakes / tarns with Louden and Quill peaks. Looking north along Marmota's summit ridge at Corona Ridge and down the Spreading Creek valley. Steven heads down Marmota Peak. 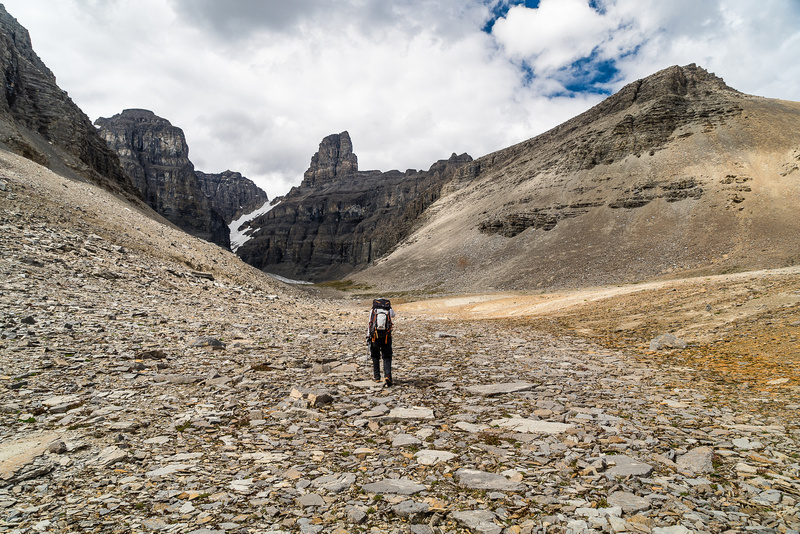 Heading to the small pocket glacier and abutment ridge. This stand-alone peak really got my attention, it's just to the south of Marmota and is unnamed I think. Observation beyond it. Looking back up Marmota (L) and over Noyes Creek Valley. Going back down the loose gully from the access ridge. It's a barren moonscape! 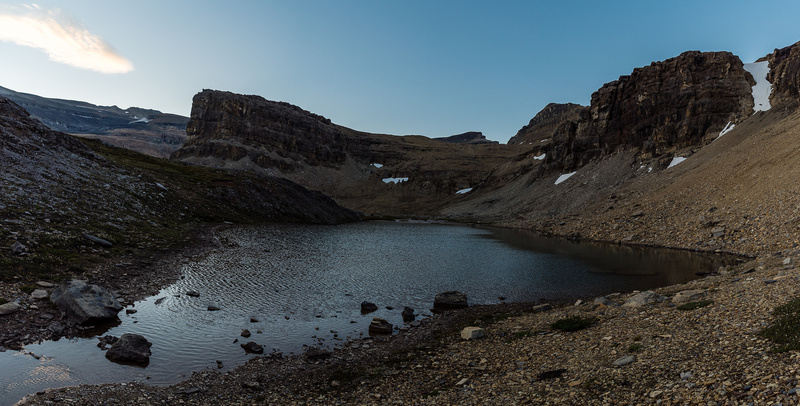 The small hidden tarn that is key to finding the highline traverse that we took. You can see the bench stretching out beyond it. Leaving the hidden tarn with Corona Ridge in the bg. Looking down Spreading Creek at the recent wildfire destruction. Hall Tower on the left and the ridge to access Corona Ridge at center. Our bivy at lower left. More River Beauties and the upper Totem Lake. The lower Totem Lakes with Howse, Chephren and White Pyramid in the bg. Looking back at the rugged Lower Totem Lake area. Looking back at Totem Falls. Our access to the lake is at upper left. We're in Lord of the Rings! Bushwhacking on descent. 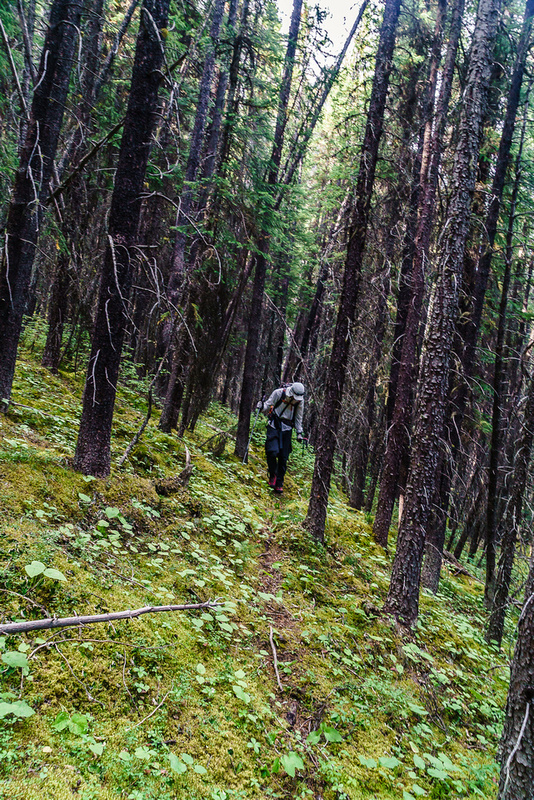 Faint trails in the bush give us hope, but usually don't last long.